Born in 1980, designed to replace the Mini, the Metro soon became a best seller. Bad press and a tendency to rot in hard to detect places eventually brought it's downfall. Fortunately there is a solution for all surviving Metros. The Metro up to 1990 shares many mechanical components with the Mini. 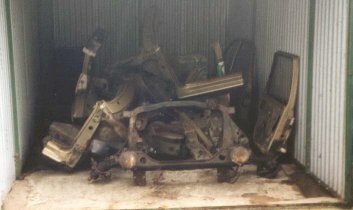 Soon your Metro could look like this, then the major mechanical parts can find their way into a cherished Mini. It only took me and my brother, Philip a few hours to transform a Metro Mayfair into this useful parts supply.